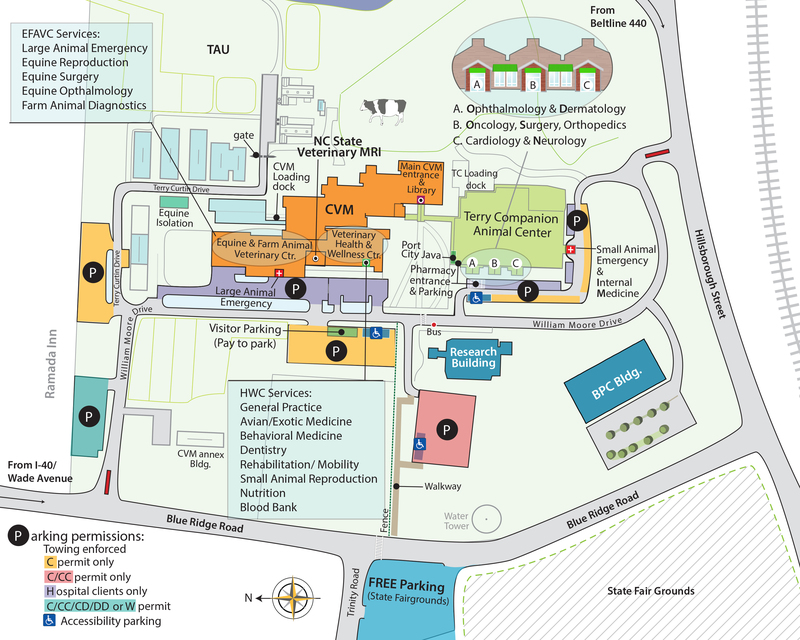 NC State Veterinary Medicine is a pre-eminent research enterprise, attracting top faculty and students. Our solution-driven, innovative research and extensive partnerships advance animal, human and environmental health and create economic, societal and intellectual prosperity. Veterinary Hospital is one of the highest rated regional academic veterinary medical complexes in the U.S. with, on average, 27,000 cases annually. Since its inception in 1983, the Hospital has treated some 182,000 animals. Working, 80-acre farm known as the Teaching Animal Unit (TAU). The TAU is a dynamic, on-campus teaching lab for students to learn husbandry, production management, and routine procedures used in livestock production. U.S. News and World Report ranks NC State’s College of Veterinary Medicine as third among the nation’s 30 veterinary programs. The Terry Companion Animal Center is one of only nine Level 1 Veterinary Trauma Centers in the U.S. This prestigious, national designation by the American College of Veterinary Emergency and Critical Care (ACVECC) indicates the highest level of patient care based on specialist and technician staffing, emergency capabilities, equipment and instrument availability, in-patient support capabilities, continuing education programs, and facilities. The House Officer specialty training program and research funding rank among the top five schools; the College faculty-student ratio is near the top. One of two national centers for the Food Animal Residue Avoidance Databank (FARAD) is located at the College. FARAD has been helping to keep drug residues from the public food supply for more than 20 years. In a partnership with the College of Engineering, the College of Veterinary Medicine pioneered osseointegration–an orthopedic surgery fusing a prosthetic limb with an animal’s bone. The procedure may benefit humans who lose limbs through combat, accidents, or disease. 250-acre Centennial Biomedical campus –home to the Randall B. Terry, Jr. Companion Animal Veterinary Medical Center, more than 60 corporate and government partners, and 73 academic units. 100,000-square foot College Research Building includes state-of-the-art facilities for research teams as well as a BioSafety Level 3 land for investigations into infectious diseases. Faculty researchers, research technicians, and graduate students conduct leading-edge studies in genomic sciences, gene therapy, vaccine development, creation of diagnostic tests, new cancer immunotherapy, and genetic research to prevent diseases in livestock and companion animals. Three medical centers and satellite and field operations offering 17 clinical services staffed by 85 clinical faculty members who are supported by 165 veterinary technicians and assistants. Veterinary Health and Wellness Center offers specialty services such as behavior, nutrition, dentistry, exotic animal medicine, and rehabilitation and mobility to pet owners. It is also where our students learn how to work in a live clinic setting through our general practice program for employees. College alumni are involved in leadership positions around North Carolina and the nation. The College partners with leaders and producers to advance the NC poultry and swine industries. College alumni are involved in leadership positions in economic considerations ranging from the $56 billion U.S. pet care industry,the NC equine industry with a total economic impact of $1.9 billion annually, and animal agriculture, which accounts for 60% of total farm cash receipts in NC.